Boeing presents the Clear Creek Education Foundation with a $100,000 grant to fund Makerspaces at all 10 CCISD intermediate schools. 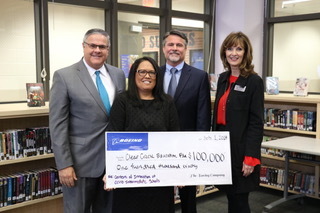 Pictured, from left, are CCISD Superintendent Dr. Greg Smith, Boeing Global Engagement official Dayni Alba, Boeing ISS Program Manager and Houston Site Leader Mark Mulqueen and Clear Creek Education Foundation Executive Director Deborah Laine. The Boeing Company: Houston, has generously awarded The Clear Creek Education Foundation a $100,000 grant to expand Makerspaces at all 10 intermediate schools in the Clear Creek Independent School District, making it the largest grant awarded in this region by Boeing. Makerspaces are the center of innovation and these hands-on centers will expose students to subject matter that is typically taught in STEAM (Science, Technology, Engineering, Art and Math) classes at the secondary level. The labs are specially designed to accommodate the needs of students taking on the challenge of learning cutting edge technology and engineering skills. Libraries have always been the place to get a book, do research and spend time reading in quiet place. Today’s libraries still have those areas, but now with so much more. When you walk into CCISD libraries you see exploration, collaboration and creation. Students are utilizing 3D printers to create prototypes, leading classes and groups on robotic component design, Minecraft and coding. Students are flying drones, composing music on digital audio systems and using green screens to illustrate content knowledge such as scientific processes and animation. School libraries have been transitioning from the “traditional” library to these learning commons and CCEF has been an instrumental partner in transforming these libraries. In the last three years, CCEF has funded 17 grants in variety of forms to teachers and students either developing or enhancing Makerspaces at their campus, totaling over $54,000 and impacting over 22,000 students each year. 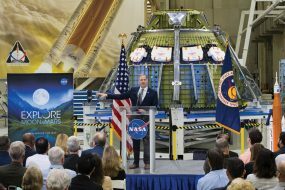 Skills such as creation, exploration and innovation have now become part of state and national standards making the growing demand of these learning hubs apparent in CCISD. Funding from Boeing will provide Makerspace tools in all 10 intermediate schools focusing on the following concepts: Design and Production, Coding/Robotics and Real-World Challenges. Based on public input and further review, the Clear Creek ISD School Boundary Advisory Committee pulled back on several original boundary change recommendations for the 2019-2020 school year, moved forward with all high school boundary proposals and made some revisions for the elementary school recommendations. The Committee withdrew all of the original intermediate school changes, with one exception. The Coronado Apartments will still move to Clear Creek Intermediate to maintain a clean feeder from Ferguson Elementary, Clear Creek Intermediate and Clear Creek High School. There will be no other changes to the CCISD intermediate school boundaries. The Committee withdrew its recommendation to move students from Parr Elementary to League City Elementary. The students who reside in Pecan Grove will remain at Parr Elementary. The Committee revised its recommendation to move students from North Pointe Elementary to Ward Elementary. Under the revised recommendation, College Park will stay at North Pointe Elementary and Stillwater Cove will move to Ward Elementary. The Committee maintained all of its original boundary change recommendations. The District will implement high school boundary changes with the incoming 9th grade class. Students will stay at their current high school through graduation. Transportation will be provided for both the current high school students as well as the incoming 9th graders to the new high school campus. Click here for more information. WAVE attendance zones are determined by a student’s high school feeder pattern. If an incoming 6th grade WAVE student and/or current WAVE student has had a change in his/her high school feeder pattern, he/she may now have a change in their WAVE campus for the 2019-2020 school year. For example, if you reside in the Kirby Woods Subdivision and attend WAVE, you will move to WAVE North (Westbrook) next year versus staying at WAVE South (League City Intermediate). Similarly, all of Greene Elementary will be moved to Clear Brook High School under this proposal, meaning any WAVE students who live in the Greene Elementary zone will now move to WAVE North (Westbrook Intermediate). If an existing WAVE student would like to stay at his/her current WAVE campus versus moving to the new WAVE campus, an intradistrict transfer request should be made. The intradistrict transfer process does not open until March 1, 2019. Click here for intradistrict transfer information. Transfer requests must be filed annually. Visit www.ccisd.net/sbac to see the full list of maps for the final recommendations, which were considered for approval by the school board at its Feb.25 meeting. All approved boundary recommendations will go into effect for the 2019-2020 school year. Clear Creek ISD is forming a School Boundary Advisory Committee to develop and present new boundary recommendations to the District’s Board of Trustees for Florence Campbell Elementary, which is scheduled to open in August 2019. The panel will also propose elementary, intermediate and high school attendance zones to relieve overcrowding where feasible. Anyone interested in volunteering his or her time may submit information online here or visit www.ccisd.net. CCISD employees are not eligible to serve on the committee. All members shall be selected by random drawing in accordance with CCISD policy, FC (Local). The deadline to apply to be on the committee is Sept. 26. A random drawing, based on membership criteria of policy FC Local, will occur on Sept. 27 at 4:30 p.m.
All meetings will begin at 6 p.m. and will held at the CCISD Education Support Center, 2425 E. Main St. in League City. The TEA report card is in, and Clear Creek ISD and its 42,000 students earned an A or Exemplary rating from the Texas Education Agency. So did Friendswood ISD and Pearland ISD, meaning this is certainly a good area for families with kids. But first, Clear Creek ISD. Actually, the school district received three grades – A or 91 for student achievement, B or 84 for school progress, and an A or 95 for closing the gap – and an overall rating of A or 92. The grade a district receives is based 40% on its STAAR performance, 40% on college, career and military readiness and 20% on its graduation rate, the education agency said. CCISD’s four-year graduation rate is 97.1% and rises to 98.5 after five years and 98.7 after six years with a 0.5% dropout rate. How did students do academically? Most schools scored in the 80s with some scoring in the 70s and others in the 90s. Clear Horizons Early College High School, where students are probably most focused on school work, scored a 98. 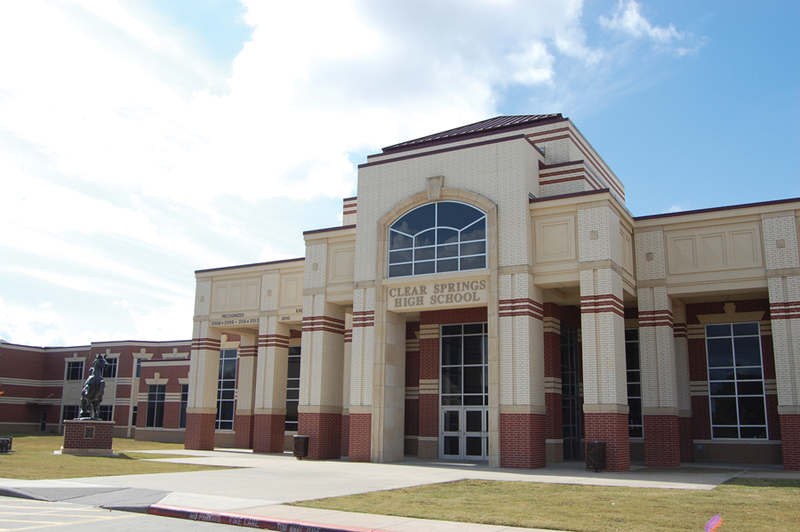 But Clear Springs High was not far behind with a 95, along with Clear Falls High with a 92, Clear Lake High with a 91, Clear Creek with a 90 and Clear Brook, 87. Highest scoring intermediate schools were Seabrook with a 94, and Westbrook and Victory Lakes, 91. At the elementary level, Gilmore took top honors with a 94, followed at 91 by Ralph Parr and Falcon Pass with a 90. Friendswood ISD did even better than Clear Creek, scoring three A’s – 94 on student achievement, 91 on school progress and 96 on closing gaps, for an overall 94. And, all its six schools scored A’s and in the 90s with a 93 for Friendswood High, 96 for Cline Elementary and Windsong Intermediate, 94 for Westwood and Bales Intermediate and 93 for Friendswood Junior High. Pearland ISD also scored high with an A, B and A for scoring 92 on achievement, 89 on progress and 99 on closing the gap. Dawson High with a 92 and Turner Career High with a 93 both scored A’s while Pearland High had a B or 88 and Pace Center High had a 93. Highest scoring middle schools were Pearland Junior High East; Miller and Alexander with a 94 and Pearland Junior High West, 93. High scoring elementary campuses included Rusty Oaks, 94; Shadycrest and Silvercrest, 91; and Magnolia, 90. Ratings for a number of school districts, including Pasadena, Dickinson, Alvin and Galveston, were delayed because of Hurricane Harvey. Clear Creek ISD is forming a School Boundary Advisory Committee to develop and present new boundary recommendations to the District’s Board of Trustees for Florence Campbell Elementary, which is scheduled to open in August 2019 in League City. All meetings will begin at 6 p.m. and will held at the CCISD Education Support Center, 2425 E. Main St., League City, Texas 77573. Clear Creek ISD students who are unable to afford the full price of school meals will be able to participate in a free and reduced-price meal program. 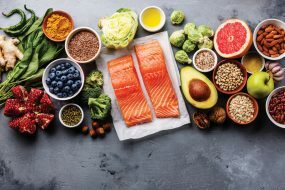 According to Director of Child Nutrition Service Fred Walker, the District will use guidelines established by the U.S. Department of Agriculture to determine eligibility for participation in the National School Lunch/Breakfast Program. Reduced price meals will cost $0.30 for breakfast and $0.40 for lunch. Foster children, who are the legal responsibility of the state agency or court, are eligible for benefits regardless of the income of the household with whom they reside. Applications will be available online at www.schoolcafe.com To apply for free and reduced‐price meals, households must fill out the online application. Applications may be submitted anytime during the school year. Under the provisions of the free and reduced‐price meal policy, Rebecca Coronado, Free & Reduced clerk, will review applications and determine eligibility. Parents or guardians dissatisfied with the ruling of the official may wish to discuss the decision with the reviewing official on an informal basis at 281-284-0712. 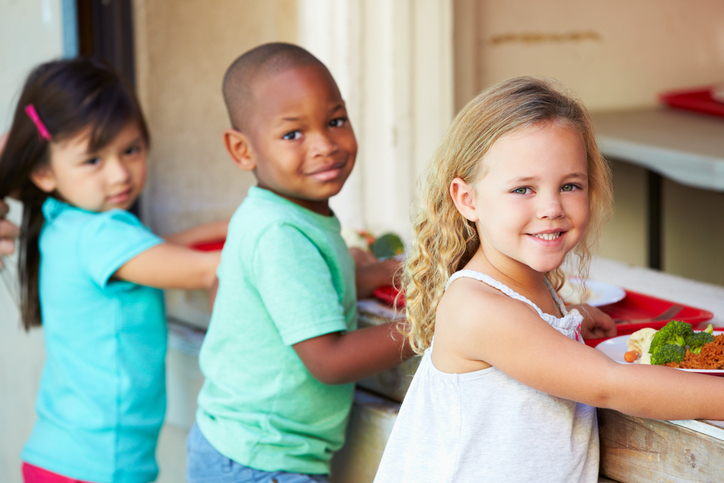 Parents wishing to make a formal appeal for a hearing on the decision may make a request either orally by calling 281-284-0700 or in writing to Child Nutrition Hearing Official, 2145 W. NASA Blvd., Webster, TX 77598. 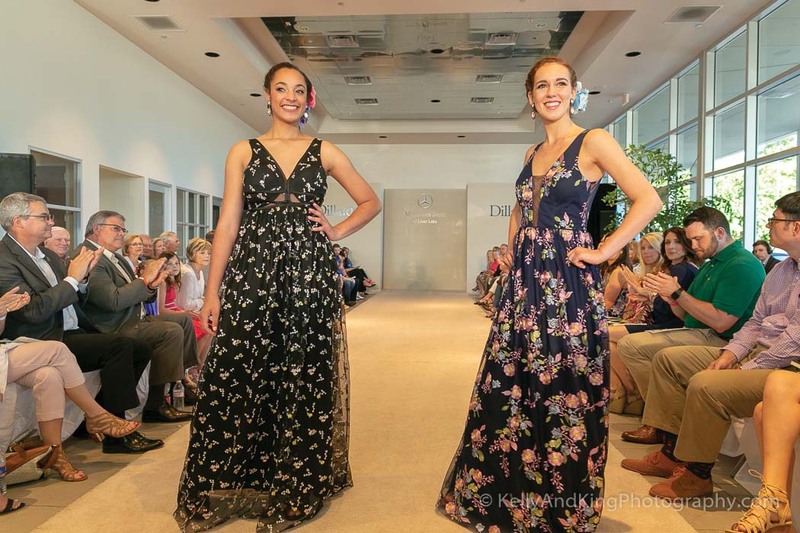 Fashion models Taylor Diggs, a junior at Clear Lake High, and Mikayla Anding, a Clear Falls High junior, show off pretty spring and summer fashions from Dillard’s at Baybrook Mall during the Clear Creek Education Foundation Fashion Show. 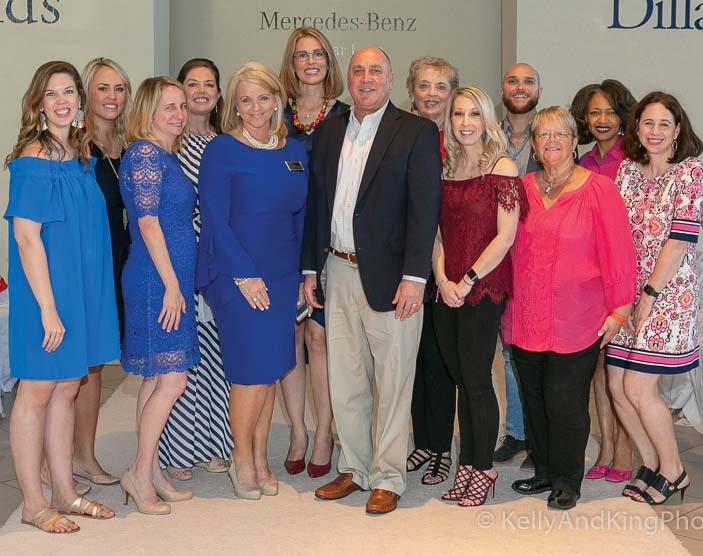 Held at Mercedes-Benz of Clear Lake, the popular style show drew more than 220 guests and raised over $28,000 to support Clear Creek ISD academic enrichment programs. The “CCISD Strong” Fashion Show, directed by national fashion event producer Lenny Matuszewski Jr., featured 50 high school juniors, along with 8 guest models who rocked the runway and 8 teachers modeling fashions from Dillard’s – Baybrook Mall and hair styles by Visible Changes. Plus, League City Elementary kindergartner, Levi Maldonado, and his art teacher and homeroom teacher, Mrs. Aalund and Ms. Barrera, strutted the runway wearing t-shirts showcasing Levi’s design as the winning artist of the annual “CCISD Strong” Kindergarten Art Contest. In addition to runway seating, 10 local restaurants provided stations offering hors d’oeuvres for guests, who also enjoyed talent vignettes featuring CCISD students – truly an event for all to enjoy. Meanwhile, student groups including the Clear Springs Jazz Ensemble led by George Solis and the Clear Lake High School Soundwaves led by Jade Blakey, entertained guests before the fashion show. The Clear Springs Theatre, led by Mark Stonebarger, wowed the audience with a few scenes from “Shrek,” while the Clear Springs High Audio Video and Production team, led by Amber Pecsenye, captured the event in a keepsake high definition video. 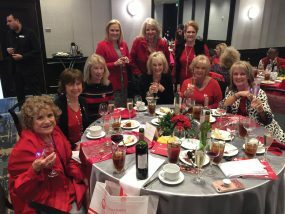 The event was planned by a 21-person volunteer committee that included CCEF Community Marketing and Events Manager Kelsey Richardson; Co-Chairmen Gina Conklin and Elizabeth Wang; and committee members Joyce Abbey, Summer Brauer, Suzanne Fair, Kimberly Fleming, Ann Hammond, Midge Herrod, Rebecca Lilley, Dinah Matthews, Laura Mackay, Amanda Mark, Sarah Moutz, Claudia Pardivala, Sonia Ponchak, Jill Reason, Deena Rigby, Skyler Rossacci, Brad Rossacci and Mary Ann Shallberg. Mercedes Benz dealer Jerry Foyt, center, welcomes the CCEF style show committee. They are, from left, Skyler Rossacci, CCEF Events Manager Kelsey Richardson, Amanda Mark, CCEF Executive Director Kaci Hanson, CCEF Chairman Jill Reason, Co-Chairman Elizabeth Wang, Mary Ann Shallberg, Co-Chairman Gina Conklin, Brad Rossacci, CCISD Trustees Ann Hammond and Paige Rander and Laura Mackay. Clear Creek ISD is gearing up to welcome new Pre-Kindergarten and Kindergarten students for the 2018-2019 school year. The District’s goal is to ensure all parents know when and how to register, what they can do to best prepare their children for school and to create an orderly, welcoming environment for our students from day one. We want our learners to start their education journey on the best possible trajectory, which is best achieved by preparing early. Below includes information on qualifications, program locations, registration dates and more. Below are registration dates for parents and guardians planning to enroll their child in Clear Creek ISD’s early learning programs. Pre-Kindergarten: Pre-Kindergarten is an early learning program to prepare children for Kindergarten who are identified as at risk*. Pre-K provides learning to children who are four years old on or before September 1. Pre-K for three year olds provides learning to children who are three on or before September 1. Preschool Program for Children with Disabilities (PPCD): The Preschool Program for Children with Disabilities is a special education program to meet the needs of students identified as needing special education services. The PPCD program provides services to children beginning on their third birthday. If you suspect that your child has a disability, please call the CCISD Early Learning Intake Center at 281.284.0330 to schedule a screening. Tuition Based Pre-K: Clear Creek ISD also offers tuition-based Pre-K on a space available basis. Visit www.ccisd.net/earlylearning to learn more about the tuition for both half day and full day Pre-K programming. *Children can attend the CCISD Pre-K program at no cost if the child meets at least ONE of six requirements as stipulated by the Texas Education Agency. Visit www.ccisd.net/earlylearning or read on under “How to Register Your Child for Pre-Kindergarten in CCISD” to find out if your child qualifies for free Pre-K.
Clear Creek ISD currently provides Pre-K programming in early childhood classrooms at 19 locations throughout the District. 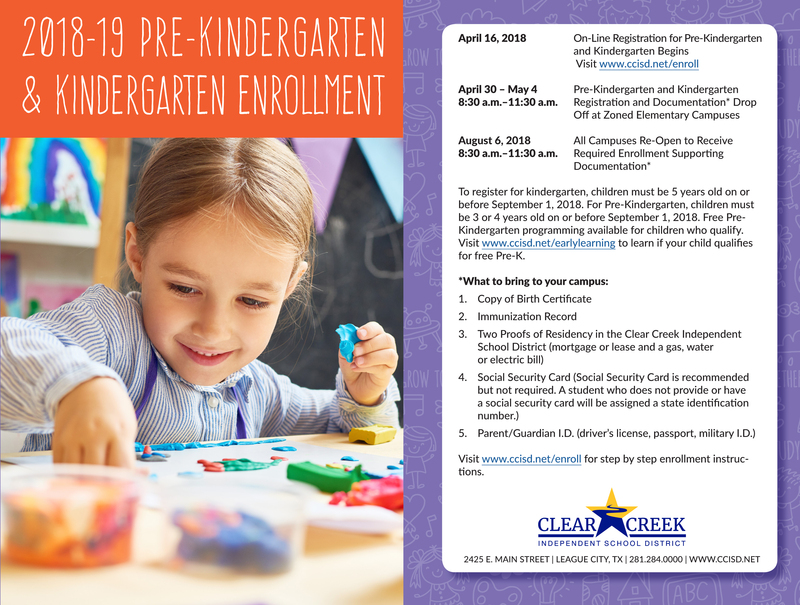 Beginning on April 16, parents or guardians may visit www.ccisd.net/earlylearning and click on “Enrollment Information” located on the left navigation bar to enroll their Pre-K or Kindergarten student for the 2018-2019 school year. Step 1. Determine/confirm qualifying status. To qualify for a Pre-K spot (four-year old), the child must be four on or before Sept. 1, 2018 and for three year olds entering the Pre-K program, the child must be three on or before Sept. 1. For more information on these qualifications, visit https://tea.texas.gov/ece/eligibility.aspx or contact your campus. To finalize registration and qualifications for the Pre-K programs, parents or guardians will need to visit the campus the student will be attending to provide the required documentation, outlined below, and complete the registration process. Additionally, if parents believe their child meets one of the six qualifications for free Pre-K, documentation of qualification will also need to be provided at the campus visit. Students must be five years of age on or before Sept. 1, 2018 and live within the District’s boundaries to be eligible for Kindergarten in Clear Creek ISD. Beginning on April 16, parents or guardians may visit www.ccisd.net/enroll to register their Kindergarten student for the 2018-2019 school year. To qualify for Kindergarten in Clear Creek ISD, student must be five years of age on or before Sept. 1 and live within the District’s boundaries. There is a lot parents and guardians can do before the first day of school to prepare their student to be successful from day one. Clear Creek ISD is proud to team with ReadyRosie to bring parents modeled moments designed to deliver valuable lessons into real life situations in an engaging way. Once registered, parents will receive a weekly playlist of videos that “train” the parent how to connect fun activities with serious learning opportunities. The videos and activities are targeted to children ages 0-5 years old to instill both foundational learning and social skills. CCISD Pre-K and Kindergarten teachers are also integrating ReadyRosie into the classroom setting and curriculum.